This excerpt from Wikipedia is a simple explanation but one that doesn’t actually fully explain the feeling of leaving the t@r, traffic, city behind and going off road into nature’s realm to explore and discover what is out there beyond our doorstep and in this beautiful country of ours. A quick foot note that the ‘a’ missing from t@r is intentional and often spelled that way by trail runners. So what awaits those of us that boldly or perhaps tentatively venture out onto the trails? One thing is for sure and that is after several years of running my favourite trails on the Cape Peninsula no two days on the trail are ever the same! Whether it be running, rock hopping, walking, scrambling, slipping, sliding, jumping, hurdling, tumbling, falling and even sometimes diving (not intentionally of course). Every trail run is guaranteed to give you something new to savour. It could be taking on the physical or mental challenge of a new route, experiencing a chance encounter with the local wildlife, or just feeling the sense of serenity and freedom that running on trails offers. One thing is for sure and that is that trail running is a workout for the body, mind and soul. For me I am in my happy place when I am out and about on the trails along the Cape Peninsula. Many times my only company being my thoughts and the rhythmic beating of my feet as they find their way across the familiar trails in front of me. The early morning dew on the vegetation provides a reminder of the pure environment I am immersing myself in. The variety of terrain underfoot requires attentive and responsive movement that whilst seemingly unnatural comes naturally. The trail leads on and those once cautious footsteps become sure and then effortless. The mind clears and drifts off to take in the surroundings whilst the body relaxes enjoying the crisp morning air as it purges the system of any impurities. The trail unravels with twists and turns testing every sinew with each step. A change in direction encourages arms to counter balance the action and a host of muscles twitch and engage to recover and secure the momentum continuing it forwards along the trail that invites and urges you forever onwards………. It’s easy to get carried away and wax lyrical in order to share the trail running experience but ultimately as with many things in life. You can’t actually experience it until you have actually lived it. For first time trail runners you don’t need fancy trail shoes and kit to get you started. Rather use your existing road running shoes at first until you find your feet just make sure it’s not raining as wet road shoes tend to make you feel like you are running with weights on your feet. Trail shoes are generally designed to be more durable, have improved grip on the sole and manage moisture better. So when you are ready to invest in a trail shoe do some homework first and get quality advice. Remember that everyone’s feet are different and what may be great for Ryan Sandes and other top trail runners may not be right for you. Speak with a retailer that knows trail shoes and inform them about the type of trails, distances you will be running and also your current road shoe brand and model. This will give you a great starting point to get the best advice on what trail shoe is best for you The Sweat Shop in Claremont and Cape Runner in Plumstead are two very informed places to start. When you are kitted out it is important to familiarise yourself with where you are running and what to expect. A great way of doing this is by first hooking up with other trail runners that you know or heading out with an organised group. Cape Town has many of these groups with CRAG (Cape Runners Against Gravity) and many of the running clubs such as VOB, Celtics, Satori or MATES offering organised weekly trail runs. Social media platforms such as twitter and facebook are yet another way to find out more about organised trail runs and meet up with fellow trail runners. Investing in a map is a handy back up when you are out exploring just make sure that you know how to use it! Slingsby have a great collection of 3 waterproof maps that cover the Cape Peninsula Trails. Once you are ready to hit the trails a whole new world of running experiences awaits you. 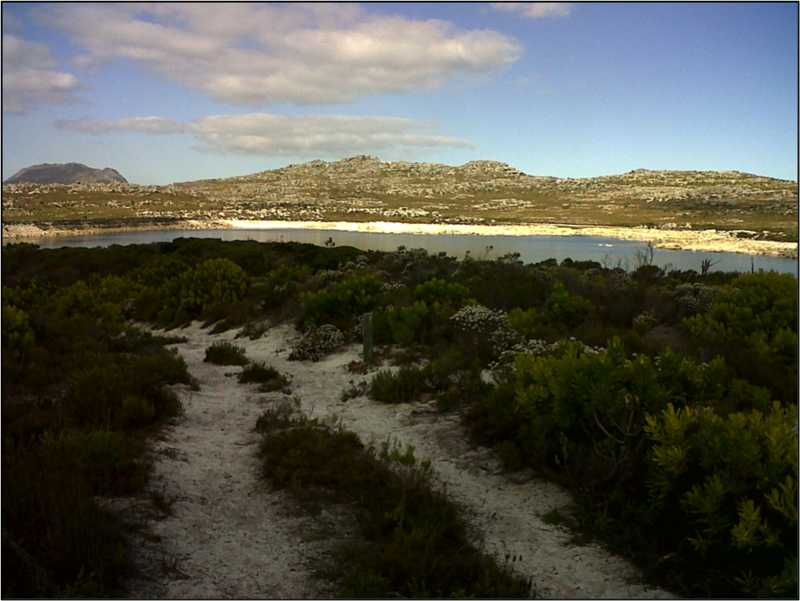 For me most of my trail running revolves around the Cape Peninsula and particularly the Silvermine and Cape of Good Hope Nature Reserves as they are close to home. Like many other trail runners I have my own favourite routes with varying distances, elevation and technicality to keep the body and mind actively challenged. Trail Running is a year round sport no matter the weather or time of day. Winter to spring is my favourite time of the year to run trail as you get to see and experience the natural changes in the national parks and reserves. During this time there is usually plenty of water on the mountain so depending on the route and duration I often don’t take water and rather drink from the free flowing mountain streams. When out trail running I always work around time not distance not only for enjoyment but also because a kilometre on the trail is seldom banked quickly and without some concerted effort. With this in mind it’s important to remember that your pace on the trail will on average be slower than on the road so correct pacing and exertion is important. It’s easy to lose trail fitness and sharpness so I like to keep a good base year round. I tend to do most of my trail runs on single track and I try to cover technical sections, hills and incorporate some speed work also on my runs. When not trail running adding some strength and core training sessions will improve power and balance and bring further improvement. When preparing for a trail race I will gather information about the route and the area it is being run in. I will then prepare and train specific to take in factors such as the race’s terrain, elevation gain, technicality, distance, kit requirements and weather conditions amongst other things. Whilst training I will try to simulate the race day as much as possible by either training on the route (where possible) or run routes similar. I also take into consideration the time of day the race will take place, my nutrition plan and any gear that I may need to run with such as a hydration belt, pack and/or wet weather kit. Prepare for the worst hope for the best is a simple but effective approach. Below are a couple of links to some sample trail routes that i run perhaps you may want to try them out sometime? Option 1 – 5km trail with some nice fast sections, climbs and a low technical descent to help find your feet. Trail Runners Guide – A great reference book that has some top tips for getting started available to purchase from Sportsmans Warehouse and through various book shops. It is out there waiting for you to experience and share. So quit reading and go trail run!